Another good month for books in February with a lot of unexpected books turning up at my door and some that I’ve been waiting for eagerly! yay! 1st pile: Lottery Boy – Michael Byrne, Shadow of the Wolf – Tim Hall (gifted), Black Dove, White Raven – Elizabeth Wein, Hook’s Daughter – Heidi Schulz, The Magnificent Lizzie Brown and the Mysterious Phantom – Vicki Lockwood (unsolicited), The Dolls – Kiki Sullivan, The Lie Tree – Frances Hardinge (unsolicited), Butterfly Club – Jacqueline Wilson (unsolicited). 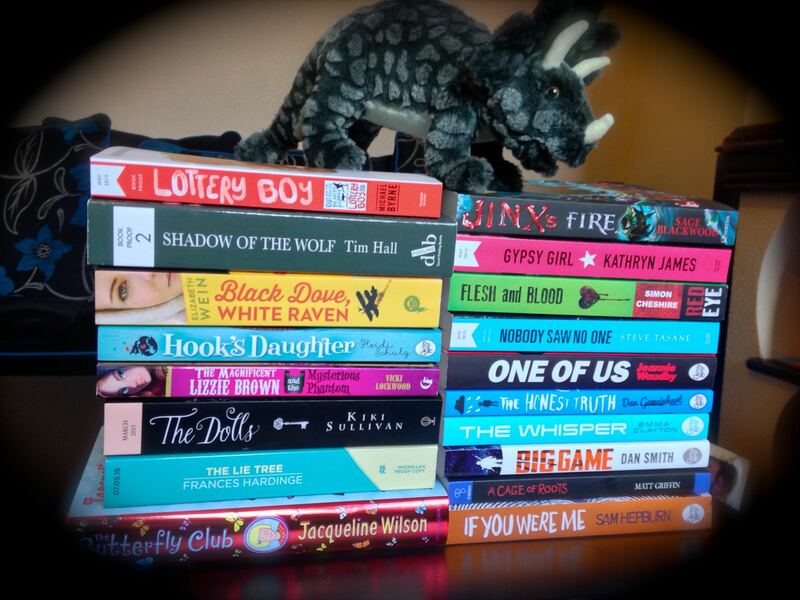 2nd pile: Jinx’s Fire – Sage Blackwood (unsolicited), Gypsy Girl – Kathryn James, Flesh and Blood – Simon Cheshire, Nobody Saw No One – Steve Tasane, One of Us – Jeannie Waudby, The Honest Truth – Dan Gemeinhart, The Whisper – Emma Clayton (unsolicited), Big Game – Dan Smith (unsolicited), A Cage of Roots – Matt Griffin (Unsolicited), If You Were Me – Sam Hepburn (unsolicited). My thanks go out to Chicken House, Quercus, Walker Books, Red Eye, O’Brien Press, Electric Monkey, Curious Fox, Usborne/ Lovereading4kids.co.uk, MacMillan and Random House for sending books this week. Chicken Licken – Mara Alperin & Nick East, Rumpelstiltskin – Mara Alperin & Loretta Schauer, The First Slodge – Jeanne Willis & Jenni Desmond, Cheep Cheep Pop-up Fun – Jonathan Litton & Kasia Nowowiejska, My Little World: Egg – Jonathan Litton & Fiona Galloway.